I’ve known Dot for almost two decades and cherish her as a friend and role model, but until this interview, I’d never heard her talk about her son’s death so intimately. The hour we spent together seemed unusually heavy (this was December, just after the election), and at the same time, I felt comforted. I left with these words ringing through me: ‘I released David to his own divine destiny many years ago.’ So while Dot says that nothing can prepare us for a death, I think she did much of the agonizing work of letting go long before her son died. This may not have lessened the shock or the pain, but from what I can tell, it smoothed the transition, allowing her to be more present through the experience. Whatever the case, I am deeply grateful for the way Dot models acceptance of all that comes our way, and the certainty that we will get through it, even if we don’t know how. How did your child die and how old was he or she? How long ago? 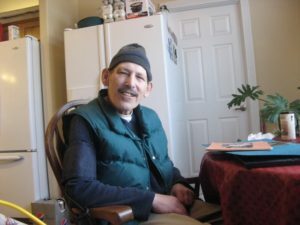 He died of esophageal cancer and he was 56 years old. He died in 2010. He was supposed to come and have brunch with us on Sunday morning, we had some of his favorite people coming. I had seen him two days before that and had noticed he was going downhill. My daughter was going to pick him up and bring him here. 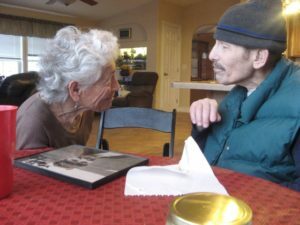 His caregiver called and said he had gotten up in the middle of the night to pee, and that he was bright-eyed and cheerful, and when she went to get him up in the morning, he was gone. Shock, of course, because we had had this little party planned. I knew he was going downhill, but still, there was just shock at first. You can know that somebody is going to die, and it’s still a shock when it happens, there’s no preparing. Did anything help prepare you for this experience? No. You can know that somebody is going to die, and it’s still a shock when it happens, there’s no preparing. There’s no preparing for anything, actually. (Laughs). You can think about preparing, but it doesn’t mean anything because when things happen, you’re right there, and you have to deal with what’s happening right then. I just keep putting one foot in front of the other, and it’s gotten me to here. If/when John (Dot’s husband) dies or I die, it’ll happen. I don’t know how it all works, I just know it’ll all work out the way it does. I trust in the moment, trust the process as it goes along. If I got through that one, I’ll get through the next thing. It’ll tell me. Life moves us through things. When I look back on all of that, his death and the days after, I don’t know how I did it. We just did it. Somehow we got through it. What has helped you in your grieving process? Spending some hours with his body. I would have stayed with him forever. I didn’t get that experience with either of my parents and it helped enormously. Somehow you’re carried through things like that. People, and circumstances, and the whole situation, and whatever else is going on in your life, and everything that happens…everything unfolds. It’s not like I thought about doing anything, we just did the next thing, and the next thing, and the next. I mean, David’s daughter was in the Bay area, and she was going to fly up here, and needed to be picked up, so we did that. I had an art show I was about to hang, the next day. And I did that. I just went ahead with my life. You know, I’m doing my life, AND I’m in this kind of tunnel, with David, this passage. It’s hard to talk about. Words aren’t easy to find. John was wonderful. When we went to the mortuary and talked about an urn for his ashes, the ones they had were all revolting. So John said he’d make some boxes. We divided up his ashes between his wife, his daughter, his sister, and us. And John made these beautiful balsa wood boxes with engravings of airplanes, because David loved airplanes, you know, model airplanes, and real ones–he even had a pilot’s license at one point. So touches like that were really helpful. And the service at his church in Medford, I was kind of dreading it, the whole religious thing, but it was just beautiful. I learned so much about David from people who knew him that I never knew. I heard about ways he had helped people, and what they loved about him. So I learned a lot about him that I didn’t know and was able to see him the way his friends saw him, and that was comforting. Poetry helped, oh my gosh! And my journal, writing poems, gathering photos and letters for the memory book I put together about him. The immediacy of the family was the most helpful. David’s wife, his daughter, and my daughter. Staying in touch with those close ones, my people. I haven’t had regrets. I almost went to see him the day before, but I was tired, and I knew I was going to see him the next day. And I thought at that moment, will I regret this? But even after he died, and I missed the chance to see him on that Saturday, I didn’t feel regret. What’s the point? The making of the documentary film about me was interesting. All the time he was ill they were interviewing me and filming and they went to the home and interviewed him, which was so sweet. Some of the celebrations we had for him were filmed and put in the documentary. So I have these bits and pieces from him. The big premier of the film was the October after he died, so there was a lot going on. It was just nice that it included him, so it wasn’t just a distraction. I got into the habit of bringing it up, to make it easier for people. Like, this is a fact, my son died. Once or twice I’d bump into somebody who’d look wide-eyed and not know what to say, but that only happened a few times and I thought it was kind of funny. What do you wish people knew about grieving a child? I guess I’d want them to know that somehow you survive. You’ll be carried. And there’s no preparation. You just live your life. Love trumps everything, and in the end that’s all that remains. All the difficult stuff just kind of melts away. David had bipolar disorder so there were lots of years of ups and downs and difficulties and complications and agony and frustration and irritation, but none of it matters in the end. In his last days it was just, I love you, I love you. And that’s still there, always. Has anything surprised you about this experience? It’s interesting who shows up. Like this woman I hardly knew showed up the day after the service with a plant, and that touched me so deeply. And it’s interesting who doesn’t show up. What do you want people to remember about David? It doesn’t matter. I don’t have any control over that. I don’t feel any need. There were years where I had to deal with my feelings around David’s illness and how he presented, and what responsibility I took for that. It was a huge part of my personal process for many years. So I released David to his own divine destiny many years ago. 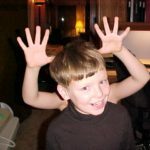 Do you still feel connected to your child and if so, how? It was a concern for me right away, I wished I had more sense of faith or belief in some afterlife, but I don’t. There’s a song that came up right after he died that really touched me and felt like a message from David, but I’m not big on all of that. I don’t get comfort from any of that. For quite a while I dreamt about him but it was always with my daughter, and the two of them were little. What do you answer when people ask you how many children you have? Oh, the boxes! I wonder if I will ever get through a conversation like this without crying. I hope not. As the son of an undertaker, I often tell the story that I’m okay with death. There is certainly a part of me that isn’t, and that part needs the reassurance of those who went through such a deep loss before me. Thank you, Dot (and John) and Lucinda.